Scotland coach Gordon Strachan says he has a big decision to make over which striker to pick to play against Poland. 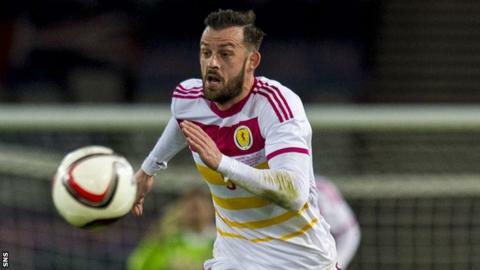 Steven Fletcher has been the preferred choice throughout the Euro 2016 qualifying campaign, with his three Group D goals coming against Gibraltar. Fletcher netted for Sunderland on Saturday and Leigh Griffiths, Chris Martin and Jordan Rhodes also scored for their clubs. "Each of the strikers have different assets," said Strachan. "But we don't have an all-round guy who has every one of these. "For a man known for loyalty to his players, Gordon Strachan gave off the air of a man who has been struggling to decide who should start up front. Steven Fletcher, Steven Naismith, Leigh Griffiths or Chris Martin - who will get the nod? "When asked how tricky a decision it will be, he paused for longer than usual and admitted it's one that he's spent most time thinking about. "He then posed a question about what constitutes a striker on form. Scoring at the weekend? Scoring in his last three matches? "Was he trying to justify his selection to himself or to the fans? It's the one area where he has received criticism from sections of the support and he seems very much aware of that. "He knows what Fletcher is capable of and he's aware of pressure to play Griffiths. He never shirks a tricky decision, but this is one that he must get right." "Then you've got to say, 'what type of game should it be?' That's the kind of game you've got to try and envisage as a coach or coaches and pick the player or players that would suit that game. "In saying that, we have a decision to make in midfield, where we've got good players." Scotland can, at best, finish third in Group D and reach the play-offs. Losing to Poland would end their chances of reaching the finals. If they draw, the Scots must hope Germany beat the Republic of Ireland to keep alive their hopes of a play-off place going into the final qualifier against Gibraltar in Portugal on Sunday. Scotland would also need the Irish to lose to Poland in this scenario. Victory for Scotland over both Poland and Gibraltar and another defeat for the Poles against the Irish would allow the Scots to claim the play-off place with Martin O'Neill's side progressing automatically to the finals in France. Strachan believes his side face a Poland team that have made a "terrific" improvement throughout the campaign. Scotland beat the Poles 1-0 in a friendly in March 2014 and, a year ago, the two sides drew 2-2 in their first Group D encounter. "They're definitely a better side and we've got better as well," Strachan explained. "They've got better because they've improved as a group, but they also have some good players back in their side. "Most of our work has been done on group defending, group attacking and group defending will hopefully nullify anything their top players in areas they want to play in. "The secret is actually if you keep the ball long enough and you keep the ball longer than them then their chances of scoring a goal are reduced." Strachan was also asked about media reports suggesting the Poles were expecting rough treatment from their hosts at Hampden. He said: "All I know is over the tournament, they've had at least 30% more fouls against them than we have, they've had more yellow cards than we have, so that's the reality."